After France, the next territory to spread the Filipino brand of hope is England where I am now with Zaza Zabert and Jerick Limoanco. Thanks to Olivier Girault for being such a great impressario in the field of social innovation using Europe as his stage with GK as the masterpiece for Social Artistry. 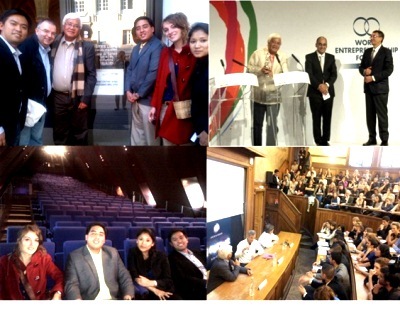 Last month, the GK Centre for Social Innovation team (Frank Chiu and Shanon Khadka) sizzled as his talents in the top business schools in France, captivating hearts to the GK mission of social justice, BOP wealth creation and countryside development. They spoke with confidence about the vision of the Farm Village University which they helped build block by block at great sacrifice to their corporate career, family and girlfriend(s). 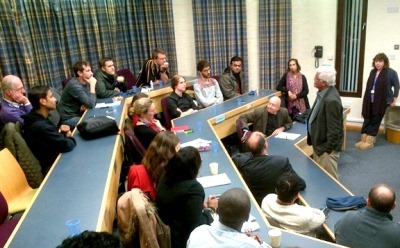 I watched them move like Adam Levine in the field of their passion as they made their pitch at ESSEC, ESCP and EMLyon. >> Read more in "Tony Meloto Accepts the Social Entrepreneur for the World 2012"
Hope is a light that attracts young minds in times of uncertainty, like a bright bulb to moths on a dark night. While the French interns gave us the boost in initiating our first farm community platform in Angat, I'm certain that more from other countries in Europe will help us complete the template for replication in 24 other sites. Thanks to Ed Chua (Shell), Fe Agudo (Hyundai), Dylan Wilk (Human Nature) and Tony Olaes (GK USA) for believing in the vision from the beginning when there was nothing yet but mud, mosquitos and snakes. Faith indeed can turn wastelands into fields of abundance. (Ed, you were right in your prediction two years ago about Enchantea: our Bayani Brew crew with Shanon, Ron, Xilca, Marie and Frank just won the top prize at the "Ultimate Taste Test" for new products at Rockwell with Enchantea and Purple Leaf Tea. Our artisan chocolate bars and fromage cheese were previous winners). So much to do, so little time for me. The young will continue the innovation with greater creativity, better technology and, most importantly, with deeper faith. I went through this path with GK Executive Director Luis Oquinena and Deputy Director Issa Cuevas when we embarked on the GK journey on sheer faith, standing up every time we stumbled, never allowing the fire to flicker because the vision was clear and the motivation was simply to do God's work. GK was built not by all the right things we did but mostly by the many mistakes we learned from. We persevered against all odds because we did not want our dream for our country to die. When bad things were done to us, we decided to do more good. When friends in Europe abandoned us, we trusted God to send us more friends to build His work. Now we have Olivier, Vanezza and hundreds of interns and many universities and corporations to help us build GK Europe. Thank you Ludo Paris for joining the GK Europe team. You have a good heart and a great sense of humor (for a Frenchman). Of course, GK attracts only the best for the least, for the greater good. Welcome Thomas Graham to the GK world of dreams. Hopefully, "Miracles of Solidarity" will give justice to your faith in GK. I met your Dad in London at my session at the School for Oriental &African Studies (SOAS) and he seemed peaceful about your decision to help me complete my second book. At last! Like you, more people are inspired to share the GK miracle to the world. The articles written by Jonas Guyot and Matthieu Dardaillon for L'Express are creating greater awareness for GK as the bridge of friendship and partnership between Europe and Asia through social entrepreneurship. We are excited about their brain-child Destination Changemaker and their plans to create their own French version of the GK Enchanted Farm Village University after completing their present project in the Philippines. >> Read Jonas and Matthieu's articles in "Young People Who are Changing the World"
Likewise, more academic institutions are curious about our brand of "abnormality" as we continue to disrupt the old normal that no longer seem to work, judging by the cluelessness from the experts here about the end to the economic depression in Europe and America. Maybe they should listen more to the poor and work with the young in finding answers to the mess that our generation has created. 1. GK is becoming an attractive brand to British schools as it is to the French. I think it will be true for the rest of Europe. It will be interesting to visit Dutch universities next year upon the invitation of Marnix and the AF/KLM team. Germany will be next as more interns are coming to us after discovering us in Facebook or in the blogs of those who have already written about their unique GK immersion experience. 2. The awards for GK in social enterprise and innovation from prestigious international organizations are opening many doors and people are starting to be curious about a new poverty eradication strategy in Asia. One reason for this is that poverty is starting to be felt in Europe. I was surprised to find out that there is now a 10% poverty index in Switzerland and 17% in France with no prospect of strong economic growth in the near future. There's 25% unemployment in Spain and 47% of their new graduates cannot get jobs. This is the scenario that college students face: the emerging economies in Asia are reducing poverty while the developed countries of the West are starting to see their poverty index rise. My audiences are always quiet and reflective when I tell them in plain economics that capital will flow where there is development, infrastructures will be built, markets opened, businesses started, wealth created, jobs generated. The solutions to the problems in Europe may not only be in Europe but in the emerging countries of the world like the Philippines. European investment to help GK end poverty in the Philippines will create business and job opportunities for graduates of their own universities. The answer to depression in Europe may be hope in Asia. This is about creating shared value. It is about solidarity economy for sustainable prosperity and peace. Miracles of Solidarity will build a kinder and safer world for our descendants when the poor are no longer seen as mere objects of charity but as friends and family worthy of sharing our time, talent and treasure. 3. We are presenting GK as the bridge between Europe and Asia with 2000 villages as destinatons for social tourism and cultural immersion and the Enchanted Farm as the Village University platform for internship and social business incubation. Language is not a barrier as the Philippines has the highest English proficiency in Asia. 4. The general mood in Europe of students and young graduates is to travel and discover new roads to their future. There is much potential in GK as the new and unexplored path with many hidden treasures to discover. A GK immersion is not about experiencing poverty but finding solutions to it; it is not about pity for the poor but discovering the power of hope in them. 5. Interest in the Philippines grows once people here know GK as an exciting vehicle to experience the culture and possibilities of Asia. We have to introduce them to the idea that Asia is not only China and India but there is much more in the Philippines and the rest of South East Asia where many of the emerging markets are. MBA students at Cranfield University were surprised at our session with them to see that the Philippines registered recently the second highest GDP in Asia at 7.1 next only to China. I told them that we have an honest President with a competent Cabinet making the right economic decisions and a strong movement like GK setting the template for ground-up development initiatives. The Human Nature story of how an Englishman found happiness helping the poor in the Philippines through GK and how he created a social business to help former urban squatters and poor farmers in rural areas is appealing to them. They loved the Human Nature products and the Theo & Philo chocolates we distributed. There is a sad reality here however that our visits hope to address. Europeans do not know much about the Philippines and are not interested to visit or invest yet. Many here tell us that GK is the first real introduction for them about the Philippines as the best kept secret of Asia. I guess our embassies are focused on diaspora affairs and issues, our domestic workers are hidden in the homes and Eurasians here have no public voice or face. 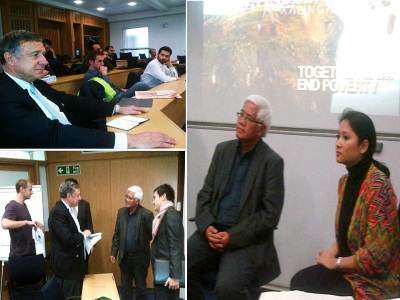 With the big crowds we gathered at Warwick Business School, only two Filipinos showed up. At the Cambridge Hub last, one Ateneo graduate came. They seemed overwhelmed that foreigners were eager to discover GK and explore the beauty of our country. I guess it is understandable for Filipinos to take awhile to internalize the possibility that the Philippines will ever become a land of opportunity after leaving it for greener pastures abroad. Hopefully they will once they see the bright and beautiful from rich countries come to the Philippines for the right reasons, like the crowd at Cambridge eager for a life with a purpose as a way of dealing with the uncertainty of the present. Many from my generation in the sixties coped with uncertainty by going to drugs or used education for excessive selfish wealth accumulation; quite remarkably, many in this generation are facing the depression in Europe by seeking solutions through social innovation. I made this challenge to Cambridge: Using the power of the Cambridge brand, influence students and graduates to create wealth with less greed and use power with less abuse. Help GK build homes for the homeless and the Philippines will be home to Europeans in Asia. Send us the best interns from Europe and we will help open markets and provide career opportunities for them in Asia. Invest in ending poverty in the Philippines and help bring back prosperity to Europe. This might sound like a crazy proposition to the brightest and the best in the top universities of Europe but none from my audiences so far has walked out or told me to my face that I was insane. They were listening intently with their hearts and asking intelligent questions perhaps because they share our faith in the power of good to overcome evil in this world as shown by the GK proof of concept. I end this piece with a big thanks to Zaza for competently organizing this mystical journey through the breathtakingly beautiful English campuses (you mentored her well Olivier) and Jerick for making me look organized and decent to the academic communities that we visited (always conscious of what my wife would say). England is now home to me.